A three-judge panel of the U.S. 9th Circuit Court of Appeals determined that Baca’s lawyers did not show enough evidence that Baca was not simply attempting to delay turning himself in to start serving his three-year prison sentence. The panel sent the case back to the trial judge in Los Angeles federal court to rule on new evidence Baca’s attorneys are expected to present to bolster the bond request. Baca, 75, was sentenced in May for his conviction on charges of conspiracy to obstruct justice, obstruction of justice and making false statements. Hochman said he plans to present evidence to show that a reversal is warranted based on judicial error and Baca should remain free while those issues are explored. The lawyer said Anderson erred in barring jurors from hearing evidence of Baca’s “cooperation” with both the federal probe and an independent county review board, and that the panel should have heard about the ex-sheriff’s Alzheimer’s diagnosis. Hochman also said that the use of an anonymous jury in Baca’s trial was a mistake that could result in a finding for a new trial. The appeals panel upheld Anderson’s denial of the bond request, finding that Baca “failed to meet his burden in demonstrating that he filed this appeal for purpose other than delay,” according to the three-page order. If Anderson again rejects Baca’s bond motion, Hochman said he would appeal to the Ninth Circuit for a second time, presenting additional evidence. 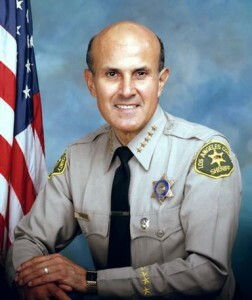 During Baca’s two trials, prosecutors described the ex-lawman as being the top figure in the multi-part conspiracy, which also involved his former right-hand man, Paul Tanaka, and eight deputies who took orders from the sheriff. Prosecutors had asked for a two-year prison term, noting that they would ordinarily seek about four years, but took into account Baca’s age and diagnosis of Alzheimer’s disease. During the sentencing hearing, however, Anderson excoriated Baca, telling him that if it hadn’t been for the ex-lawman’s health, Baca would have received the same five-year term given to Tanaka, the former undersheriff. At that point, sheriff’s officials closed ranks and began an attempt to halt the formerly covert investigation by concealing the inmate-turned-informant from federal prosecutors, who had issued a summons for his grand jury appearance. The charges against the various sheriff’s officials involved a host of illegal acts, including a 2011 incident in which two sheriff’s investigators confronted an FBI agent in the driveway leading to her apartment and falsely told her they were in the process of obtaining a warrant for her arrest. Baca denied having advance knowledge of the illicit attempt to intimidate the federal agent. Prior to the first trial, Baca had pleaded guilty to the lying count, but subsequently backed out of the plea deal — which called for him to serve no more than six months in prison — after the judge rejected the agreement as too lenient. If Baca had not withdrawn from the plea, he could have been handed a sentence of five years behind bars. He was then indicted on the three felony counts for which he was subsequently convicted. 1 comment for "Judges reject Baca’s request to remain free on bond while appealing conviction"
Burn in Hell you son of a B****!